Other than this, I couldn’t find any information on binding with bonded leather except that it’s perhaps not as strong as real leather. So I made my way over to Talas and bought a yard of Sedona Honey bonded leather then set about experimenting. It’s a bit like thick book cloth with a leather texture, definitely plasticky on the wrong side. 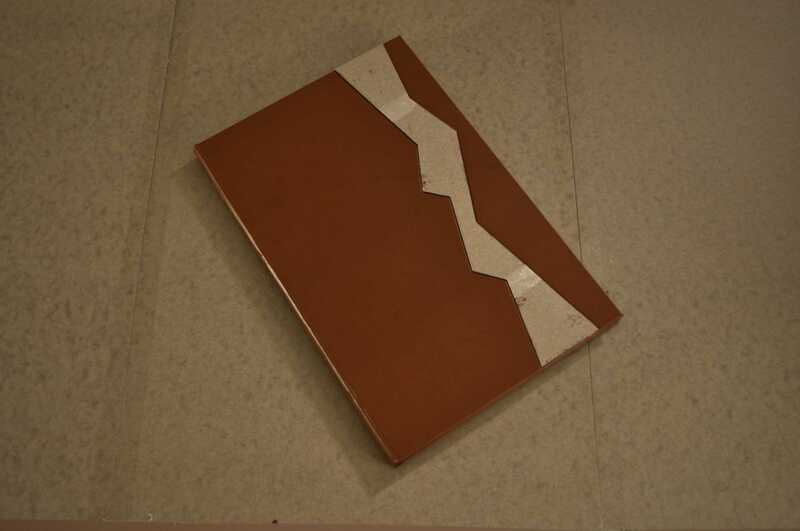 One of the binders I showed it to wasn’t impressed with the texture, but she’s definitely a purist. I’m not (obviously, since I’m considering working with bonded leather in the first place), and I think the texture’s great. You could definitely do inlays and real leather onlays (there’d be a step if you tried to use bonded leather for onlays). 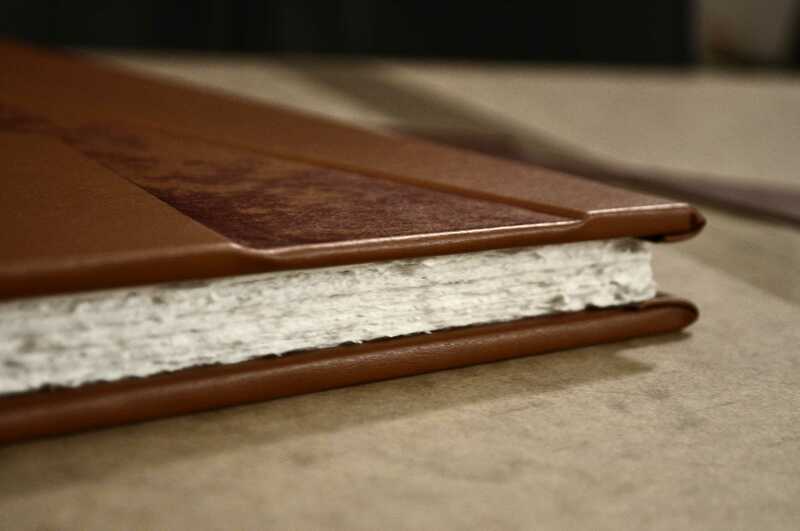 I did a split-board binding with raised bands, a truly typical leather binding, because I wanted to see if had the moldability of leather. As you can see, it is somewhat moldable, but it’s not spectacular. However, based on my cover decoration, I suspect that if one were to do a spring-back or hollow tube binding with false raised bands, it would work just fine. 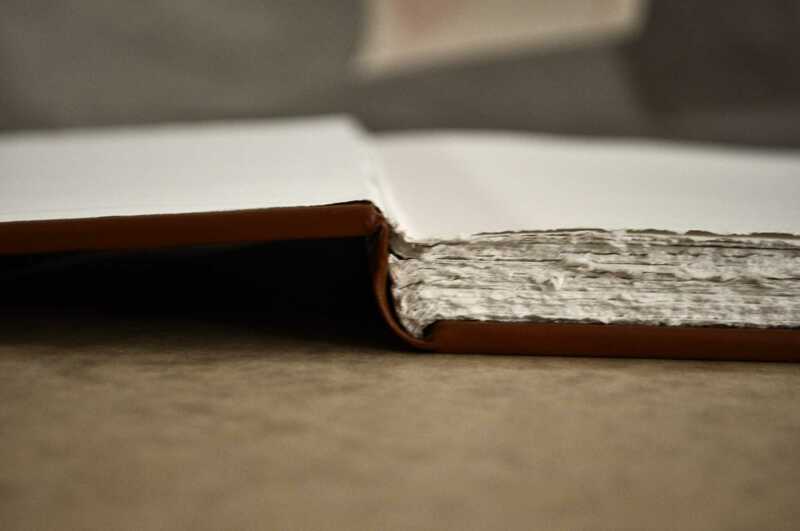 You would just press the spine really good in between the bands before covering the book. I really like how the debossed cover decoration worked out. You definitely couldn’t do this with book cloth. Let me explain exactly what I did. If you’ll recall, this is a split-board construction, so two boards laminated together with tapes sandwiched in between. On the outer board of the front cover, I cut the design all the way through, not just scoring and peeling like we do for insets. 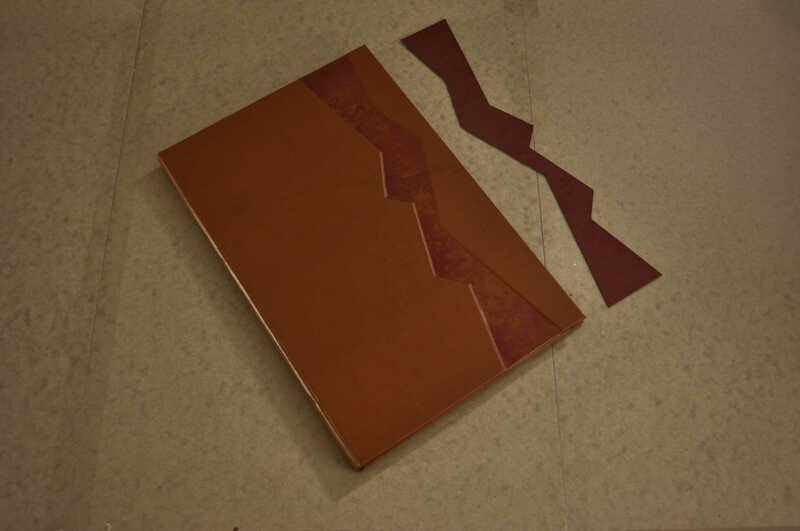 I also removed about 3/16 of an inch from the foredge so I could spread the pieces out, making room for the piece I removed to sit on top once I covered the book with leather. 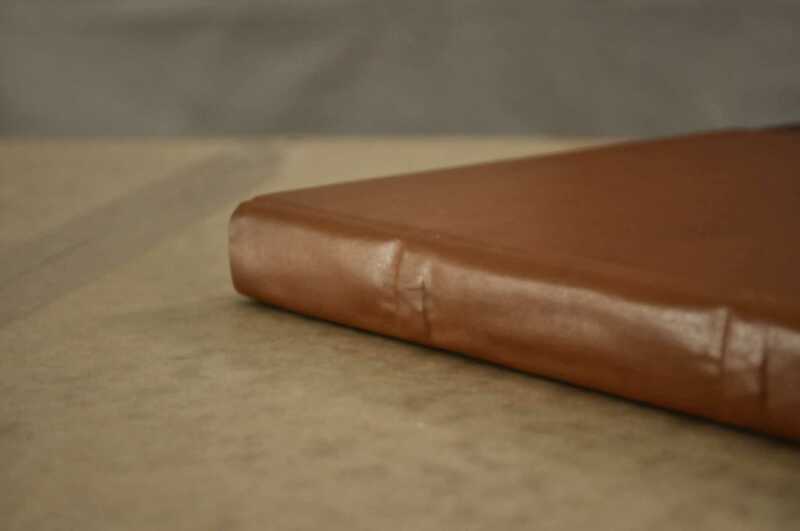 I rolled the leather across the cover, pressing it into the design, rather than slapping it across the cover, then pressing it into the design. I put that piece that I removed into the design and pressed it over night with some grooving boards (careful not to tear the leather doing this). I tried to do mitered corners, but this material WILL NOT MASH, so I ended up with very pokey corners. In the future, I will do classic corners where you pull the corner of the material in, rather than cutting the corner on the 45, then wrap the head, tail, and foredge. It makes for a bulkier corner, but I think that’s better than these sharp ones. The last thing I tried was printing. It hot stamps just fine, but I also tried an oil based ink on the cover design. I inked up that piece I cut out and pressed it overnight again. It was a little smudgy when I took it out so I let it sit a few days. It didn’t smudge anymore, but I thought it conceivable that the oil from my hands could interact with the ink and unknowingly getting that on my hands could lead to a minor disaster in my line of work, so I rubbed on some olive oil and the ink came right off. So no absorption properties to speak of, but it did leave a bit of a stain, subtle, which I kind of like. 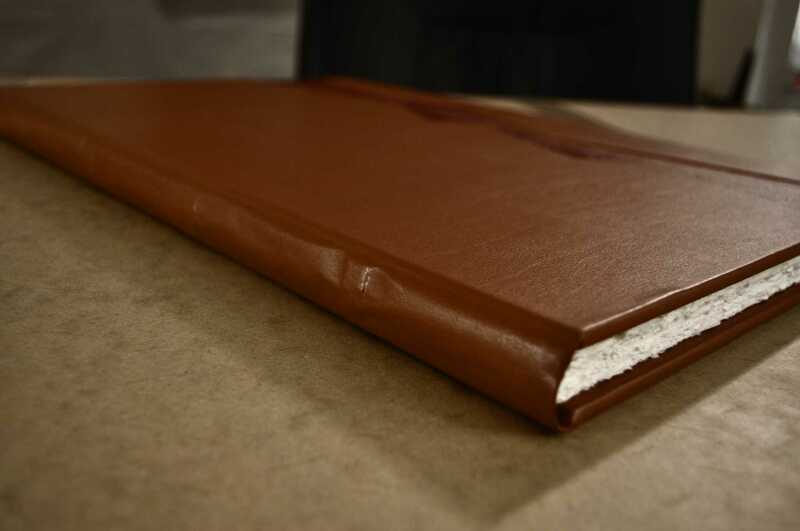 I think that about covers what I discovered about working with bonded leather. 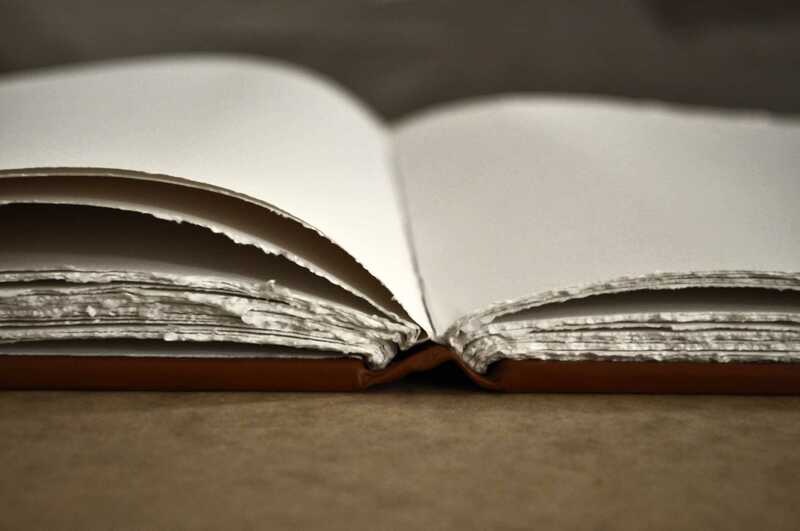 I’ll make another book with false raised bands and let you know how it goes. This entry was posted in Bookbinding, Paper Arts. Bookmark the permalink. Great article. I was just wondering, when you glued the bonded leather to the board did you go with paste (as with real leather) or PVA (as with book cloth)? I too am trying to bind with bonded leather and I too can’t find any info online about working with it! 100% PVA. 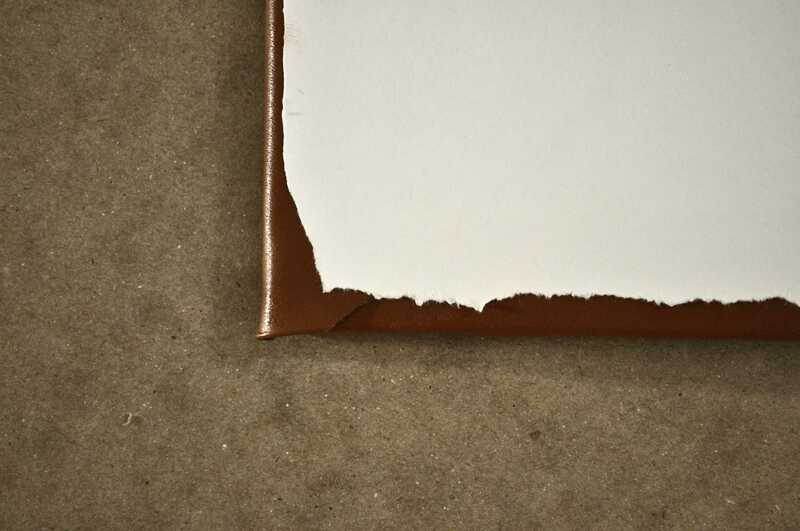 Paste won’t soak in like it does with leather, and you want something that will dry fast because it takes a lot of persuasion to mold it and if your adhesive dries too slowly, it won’t keep its shape.